Heat oven to 350°F. Spray 2 1/2-quart casserole with nonstick cooking spray. Cook macaroni to desired doneness as directed on package. Drain. In large nonstick skillet, cook and stir turkey and garlich-pepper blend over medium-high heat for 6 to 8 minutes or until turkey is no longer pink. 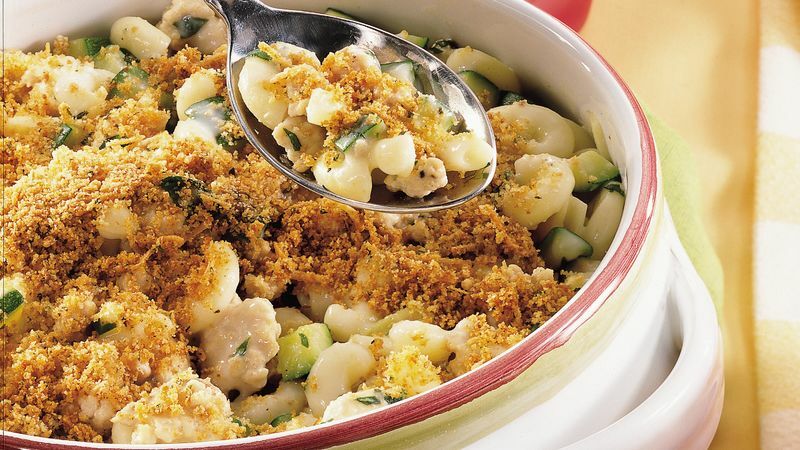 Add cooked macaroni, zucchini, basil and Alfredo sauce; mix well. Spoon mixture into sprayed casserole. In small bowl, combine all topping ingredients; mix well. Sprinkle over casserole. Bake at 350°F. for 30 to 40 minutes or until thoroughly heated. Light Alfredo sauce is stocked in the refrigerated section of the grocery store next to the refrigerated pastas. Some potent ingredients, even in small quantities, give lots of flavor to a dish. The romano cheese in this recipe takes this role. Enjoy with sparkling water. For dessert, serve sliced pears or baked custard.